Truman will host a free presentation by inspirational speaker and ESPY award recipient Aaron Thomas at 7 p.m. Sept. 18 in Pershing Arena. Thomas is the son of the late Ed Thomas, a long-time football coach for Aplington-Parkersburg High School in Parkersburg, Iowa. Not long after helping his town recover from the aftermath of a tornado, Ed Thomas was killed at the hands of a mentally ill former player. Aaron Thomas and his family found the strength to immediately extend grace and kindness to the family of the man who murdered his father. He is an inspiring example of courage, resilience and the very best of the human spirit. At the 2010 ESPY Awards Thomas and his family received the Arthur Ashe Courage Award. The 10-minute video produced by ESPN, which documents the Thomas family story, can be seen online at www.youtube.com/watch?v=ukodLTOTens. In his presentation, Thomas shares his story and shows audiences how to deal with adversity, set important goals and live a meaningful life of passion. Imparting the lessons of his father and lessons from his own career inspiring young people, Thomas challenges organizations to think through what they must do to stand out, be the best in their field and define—and exemplify—the true value they provide to their members, customers and employees. Thomas’ appearance is sponsored by Bulldog LEADERS, Truman Athletics and ROTC. For the 16th year in a row, Truman State University has been recognized as the No. 1 Public Regional University in the Midwest. This recognition comes from the newly released U.S. News & World Report’s 2013 edition of “Best Colleges.” Truman is also ranked as No. 8 overall in the region among both private and public institutions that provide a full range of undergraduate and master’s programs. Truman was also given a No. 1 ranking in the “A Strong Commitment to Teaching” section and was one of only four schools in the Midwest region to be listed in this section. The University was also recognized at the No. 4 spot in the region in the “Great Schools at Great Prices” section. Truman is the only public school on this list and the only Missouri school among the 15 listed colleges. This year’s guidebook highlights other aspects of Truman that make the University unique. In the “A Focus on Student Success” section, Truman was recognized in both “Study Abroad” and “Undergraduate Research/Creative Projects.” Truman is continuously recognized as being one of the top master’s universities with a high population of students studying abroad. Truman’s undergraduate research program is well known for the fact large numbers of students are able to participate in research at the undergraduate level as opposed to waiting until graduate school. Inclusion in this section is based on nominations from college presidents, chief academic officers and deans of admissions. The schools with the most nominations were listed alphabetically. U.S. News & World Report bases its regional rankings on peer assessment, graduation and retention rates, faculty resources, student selectivity, financial resources and alumni giving. Complete listings are available at www.usnews.com/colleges. The U.S. News & World Report ranking is the latest recognition for Truman. In the Washington Monthly September/October 2012 magazine, Truman was recognized as the No. 6 master’s university in the nation. Truman is the only Missouri school listed in the top 50 and the only public Missouri school on the entire Top 100 Master’s Universities list. Truman’s United Way Campaign began Sept. 13 with a goal of $56,000. All faculty and staff members should have received information about the campaign through campus mail. Individuals who did not receive campaign information, or have questions, may contact co-chairs Sally Herleth at sallydet@truman.edu or Pam Ryan at pjryan@truman.edu. Pictured above, members of the Truman United Way campaign. 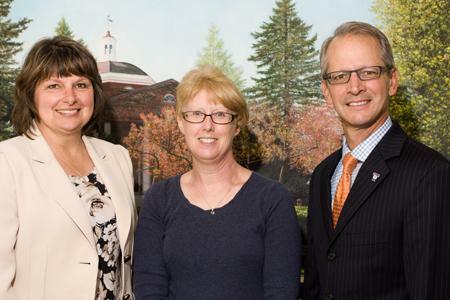 Left to right: Sally Herleth, co-chair; Pam Ryan, co-chair; and University President Troy Paino. Donations support the United Way of Adair County, benefiting those in the area. The local United Way has among the lowest overhead in the nation. This allows a greater percentage of contributions to go straight to local programs that help people pursue the goals of education, income and health. Those interested in seeing America’s vivid and tumultuous history brought to life are invited to attend the University Theatre Department’s performance of “Rebel Voices” at 8 p.m. Sept. 26-29 in the James G. Severns Theatre, located in Ophelia Parish. The play is based on the book “Voices of the People’s History of the United States” written by Howard Zinn and Anthony Arnove. The book is a collection of speeches, letters and writings from both famous and little-known Americans whose work became major symbols of non-traditional thinking throughout the eras. A cast of 10 students will portray various American figures including well-known characters such as Helen Keller, the New York Mechanicks, Susan B. Anthony, Tecumsah, Emma Goldman, Eugene Debs, Frederick Douglass and Bob Dylan. Immediately following opening night Sept. 26 Rob Urbinati, the playwright, will host a question and answer session in the theatre. A reception with refreshments will be offered in the Ophelia Parrish lobby. 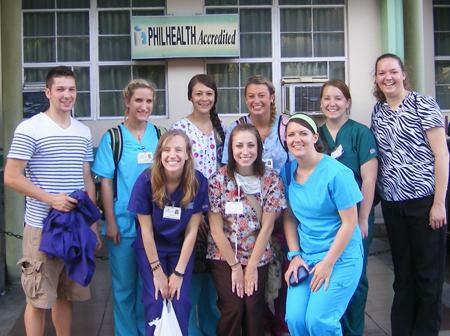 Tickets are available in the Ophelia Parrish Box Office, Monday-Friday, 10 a.m.-4 p.m.
Nine Truman nursing students will present “Transcultural Nursing Experience in the Philippines” at 7 p.m. Sept. 25 in the Student Union Building Alumni Room. The presentation focuses on the students’ hands-on clinical experience and cultural immersion while spending three weeks studying abroad in the Philippines. During the first half of the trip students work at the nonprofit government facility Jose R. Reyes Memorial Medical Center in Manila. There, they volunteer in areas such as labor and delivery, pediatric, intensive care, the emergency room and the operating room. Students from the Truman Nursing Department will discuss their clinical experiences while studying abroad in the Philippines during a presentation Sept. 25. Pictured, back row, left to right: Taylor Frymire, Caitlin Schaefer, Courtney McIntire, Maggie Scharnhorst, Tori Johnson and Emily Garlock. Front row, left to right: Jessica Greenwood, Briana Keller and Emily Fahey. Students finish the program by traveling to Iloilo City, where they are paired with local nursing-student “buddies” from West Visayas State University. With their buddies, Truman nursing students participate in various clinical experiences such as visiting a leprosarium, a social hygiene clinic, a nursing home and conducting home visits in a village located just outside of Iloilo City. Preparation for the trip began last spring. Students researched cultural practices and communicable diseases common in the country. New bleachers were installed in Pershing Arena over the summer. The process included removing the wooden bleachers and installing new benches and approximately 400 chair back seats. The remodel includes closer seating on the west side and additional seating on the north baseline. The project, funded by the Student Athletic Fee, began with the removal of the bleachers in late May. The former seats were installed in 1979 when the old arena court was shifted from the east/west alignment to its current north/south configuration. 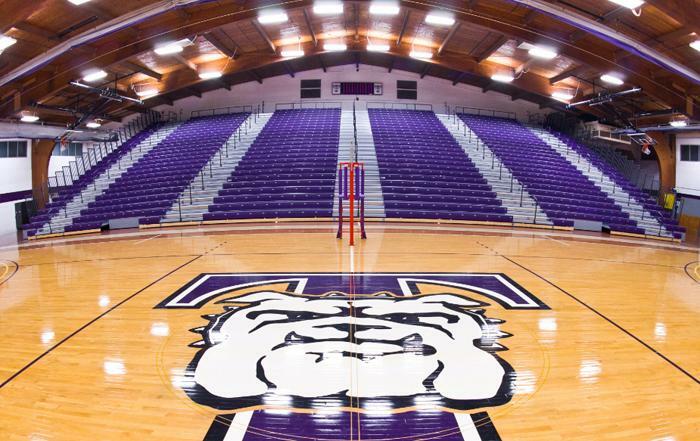 In addition to the bleachers, a new sound system and acoustics was installed during the summer to enhance the audio and game day presentation for Bulldog events. Donald Asher, an internationally acclaimed author and speaker specializing in professional development and higher education, will help students write their own personal statements for graduate school applications. Seventy-five seats are available for the Sept. 25 session, and 50 are offered Sept. 26. Pre-registration required. Go to career.truman.edu for more information. Come and listen to Donald Asher discuss ways to reduce the cost of graduate school and hear tips for better preparing for the future after graduation. Thinking about graduate school? Come and learn about how you should be preparing for your upcoming future. The Peace Corps is currently seeking applicants from Truman to fill assignment areas in 2013. Peace Corps volunteers help communities in need, gain valuable cross-cultural skills and become a citizen of the world. Learn more and visit with a representative. Come visit the Career Center to learn about its programs, events and services. Get free prizes and enter to win a $50 gift card to the Truman Bookstore. Phil Lutgendorf, professor of Hindi and modern Indian studies at the University of Iowa presents “Chai Why? The Making of the Indian ‘National Drink,’” an examination of the social affects of tea drinking on popular Indian culture. Oct. 1-5, 10 a.m.–2 p.m.
Constitution Day commemorates the formation and signing of the U.S. Constitution Sept. 17, 1787. Thirty-nine delegates to the Constitutional Convention met for the last time on this date and signed the document they created. To learn more about this important day in American history check the links on the Constitution Day page of the Truman website. Formal or dance shoes are suggested. $20 for student teams, $25 for non-student teams, $5 per individual. Guaranteed two games. Join us for an evening of free food and Hispanic culture. The Oct. 4 meeting will focus on STEM majors, but students from any major are welcome to attend. For more information, visit mcnair.truman.edu. Yoga on the Quad 12-3 p.m.
5-6 p.m. Baldwin Hall 251. Presentation by Brenda Higgins, director of University Counseling Services. Check out the new Digital Library collection. It features digitized objects that include manuscripts, photographs, glass slides, vintage sheet music and other unique and rare items from Special Collections and University Archives. New items and collections will be added on a continuing basis. Visit digitallibrary.truman.edu. Admission is $3 for Truman students with an ID and $5 for general admission. Oct. 25 receive $1 off with a canned food item. Oct. 28 is kids day. From 1-3 p.m. bring kids for a fun walk through the maze. There will be treats as well as arts crafts. Admission is $3 per child. Bulldog LEADERS, Truman Athletics and ROTC will host ESPY award-winning inspirational speaker Aaron Thomas at 7 p.m. Sept. 18 in Pershing Arena. Thomas is the son of the late Ed Thomas, a long-time football coach for Aplington-Parkersburg High School in Parkersburg, Iowa. Not long after helping his town recover from the aftermath of a tornado, Ed Thomas was killed at the hands of a mentally ill former player. In his presentation, Thomas shares his story and shows audiences how to deal with adversity, set important goals and live a meaningful life. Jillian Anthony, campus recruiter for The Washington Center for Internships and Academic Seminars, will be on campus Sept. 19. Join Anthony and the Truman in Washington Program for an information meeting to discuss internship opportunities in the D.C. area at 6 p.m. Sept. 19 in the Student Union Building 3202. Past D.C. interns will be attending to share their own experiences and answer questions. For more information, visit the Truman in Washington Program website at twp.truman.edu. 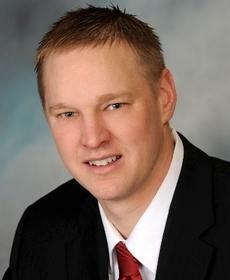 Contact Jay Self at selfjw@truman.edu with any questions regarding the Truman in Washington Program. The Wellness Zone, located inside the library, will be celebrating its grand opening from 11 a.m.-1 p.m. Sept. 20 on the Quad. Students will have the opportunity to practice and learn about stress management techniques. Two back massage chairs located in the library will be available for free trial during the grand opening. Blood pressure screening, stress balls and other stress management resources will be available, as well as some healthy snacks. The School of Social and Cultural Studies will host an open house at 4 p.m. Sept. 21 in Barnett Hall. The open house is an opportunity for faculty and staff to see the renovations recently completed to facilitate the relocation of the departments of Psychology and Military Science, as well as the facilities for the departments of Communication, Justice Systems and Society and Environment. Stop by for complimentary refreshments and tours from 4-5 p.m. The University will be conducting a public auction of surplus property at 9 a.m. Sept. 22 at Dulaney-Baldwin Building No. 4 located on Hwy 63 South and LaHarpe Street. Ekklesia will sponsor a free concert by the a cappella gospel group Durant at 7 p.m. Sept. 22 in the Student Union Building Georgian Room. SafeZone training will be available to faculty and staff at 4 p.m. Sept. 24 in the Student Union Building Alumni Room. The program will inform participants on how to help create a safer environment for LGBT students on the Truman campus. For more information, contact Joe Hamilton at hamilton@truman.edu or visit safezone.truman.edu. Amber Johnson, professor and chair of anthropology, will give a short talk about the archaeology of Northeast Missouri at 7 p.m. Sept. 27 in the Ruth W. Towne Museum. The talk will focus on the basic pattern of culture change in this region and why it differs from surrounding regions. There will be a brief meeting for anyone interested in becoming a member of the newly founded Northeast Missouri chapter of the Missouri Archaeological Society immediately following the talk. Reslife will host Octoberfest from 4-7 p.m. Oct. 5 on the Mall. Stop by for fun, food, root beer and live performances. The Center for Academic Excellence newsletter is now available at excellence.truman.edu/CAE_newsletter1.pdf.